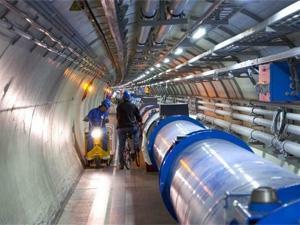 South Africa's status as the only African country to crack the nod to be part of the Worldwide Large Hadron Collider Computing Grid (WLCG) is set to stimulate scientific research locally, and deal with big data issues. The WLCG, the world's largest supercomputing grid, is a global collaboration of more than 170 computing centres in 42 countries and links up national and international grid infrastructures. Its mission is to provide global computing resources to store, distribute and analyse the about 30 Petabytes generated each year by the Large Hadron Collider at the European Organisation for Nuclear Research (CERN). SA officially joined the grid recently when the Centre for High Performance Computing (CHPC) at the Centre for Scientific and Industrial Research's Cape Town campus was designated as a tier two site. Bruce Mellado, an associate professor at the University of the Witwatersrand's School of Physics who has been working on CERN's LHC project, describes this move as "big news"
The £2.6 billion "Big Bang" particle accelerator and the globe's largest experiment led to the discovery, in 2012, of what has become accepted as the elusive Higgs boson. This discovery is anticipated to catapult physics into a new era, as it will be able to probe previously untouched areas, such as dark matter and dark energy. The Higgs particle - or boson - is named after Peter Higgs, who was one of six authors who theorised about the existence of the particle in the 1960s. It is commonly called the "God Particle", after the title of Nobel physicist Leon Lederman's "The God Particle: If the Universe Is the Answer, What Is the Question? ", according to Wikipedia. CHPC director Happy Sithole says the endorsement of the computing centre is something SA should be proud of. He says the country will "immediately" be involved in the second phase of the LHC project, which is under way. In addition, says Sithole, the facility will be used by other science domain areas, such as bioinformatics, materials science, and weather and climate scientists, making it crucial for further research enablement in the country. Mellado says the computing power will not only be used for CERN's needs, but will serve the entire country to allow for data modelling, which will also allow South African scientists to deal with the question of big data. "It's open to anybody." Other centres within SA are also connected to the grid via Cape Town, such as the one at the University of Witwatersrand, and the one at the University of Johannesburg. Sithole notes the CHPC provides service to all universities in the country. "This service will be used by all the high-energy physicists in country and also for worldwide collaborations." Sithole adds the grid's power could also be used for some industry programmes to help them improve their production rate. He adds talks are under way to look at collaboration in medical fields. Mellado explains the WLCG is an international grid of supercomputers being used to crunch the amount of data produced by the LHC. He notes it has been running for a while, with SA unofficially helping out for the past few years. The WLCG, which runs two million tasks a day, handling more data than Google does each year, is based on open source software that intelligently sends data processing requests to PCs with space capacity, Mellado explains. He says the local supercomputing grid is being built out, and a lot of work is happening in government circles to add more computers and entities. South Africa has chosen the CERN model for its own high-computing grid plans, says Mellado. He is hopeful the Square Kilometre Array will also join the grid. The telescope project is heading towards construction phase and, on completion in 2025, will generate massive amounts of data that need to be analysed.